The Simmons Empyrean Bed Sheet Set is a sheet set which is made of 100% super soft high quality brushed microfiber fabric. These sheets are super soft, luxury, cozy and comfortable. The advanced microfiber bedding is super cool, breathable, and even more durable than expensive 100% thread count cotton sheets. It is hypoallergenic, anti-bacterial, environmental friendly and resistant to dust mites. 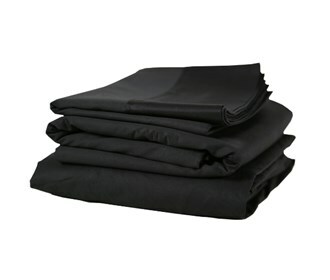 The Empyrean Twin Size Black Bed Sheet Set has many exciting features for users of all types. The Empyrean Twin Size Black Bed Sheet Set is sold as a Brand New Unopened Item.